We have been looking for the right piece of land near enough to our organic family farm to start a camping site of some description but finding that perfect piece of land locally was becoming more and more difficult. One day in early July we had a phone call telling us that Bloomfield Camping was coming on the market. We had never considered buying a site that was already established but thought it was worth a look as it was only a 15 minute drive from our farm. So, we roll up to Bloomfield without high expectations but wow!!! were we in for a huge surprise. All I can say is that Bloomfield blew us away!!!! We were greeted by Jon whose enthusiasm for the site was instantly infectious. As we walked through the avenue of willow drawing you into the site the butterflies in the stomach started. And when we caught a glimpse of Poplar, the first Yurt we knew this is what we wanted. 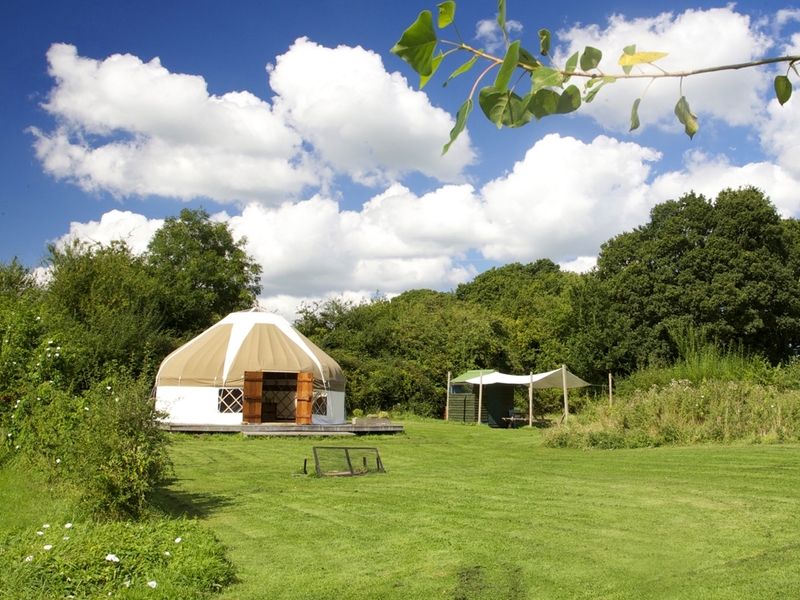 With it’s abundance of space…..the Yurt pitches are huge! and plenty of room to wander around and kids to run and play safely, beautiful large ponds with weeping willow trees hanging over them, ducks swimming, fish in the ponds, all eco friendly and then we saw the majestic view of the impressive Hambledon Hill we knew an offer had to be made! From that day we haven’t looked back. The buying process was a bit long winded but at last we are here at Bloomfield……..and there’s nowhere else we would rather be. We warmly welcome you to join us and enjoy our fabulous hidden haven…….seeing is believing. We had been looking to set up something like this on and off for a number of years after bring disappointed by a number of camping experiences. We spent over 2 years looking for a suitable piece of land but something always got in the way of it becoming “the” place – whether that was access, suitable parking, terrain or ancient woodland designations. On seeing this plot though we instantly fell in love with it and could see all of the potential that it offered. After a frantic and nerve-wracking few minutes of bidding at auction we managed to secure the purchase of this superb 7 acre site, in the shadow of Hambledon Hill, which now forms the centrepiece for Bloomfield Camping. The land was in great condition when we took ownership but we immediately added to this with some hard landscaping, drainage, planting of native trees and hedging. Another early job was to clear the entrance area and put in the new car park. This instantly gave us a great staging area and allowed us to plan the rest of the development. In the past we have stayed at too many campsites that have not had much space between pitches, have ruined views by overcrowding and have not told the whole truth when it comes to descriptions. Setting out the pitches was extremely important as we knew that getting this wrong could spoil the whole camping experience. At the heart of the project is the aim of making this the type of site that we would like to visit. The next job was to set out the paths to the pitches and then to start building the decks. These provide a great solid and level base for our Yurts. Once we had recovered from moving the huge amounts of wood across the field to build these we moved onto the kitchen units. Again, past experiences drove the process to improve on what we had seen elsewhere. Each kitchen comes fully equipped with gas cooker with hob, grill and oven. All cutlery, crockery, pans and utensils are provided as standard. Coming off the kitchen is a canvas canopy to provide covered seating. Once we had repeated this process for the other pitches we moved on to building the reception and toilet/shower blocks. Again, we have tried to improve on what we have experienced elsewhere and so have some extremely spacious facilities. 2 flushing toilets, 2 wash basins and 2 showers all have loads of space, shelves, hooks etc. Power for the block comes from our solar install and powers the lighting, pumps for the packaged sewage system and a hair drier and straighteners in one of the wash basin cubicles. We have also added charging boxes so that each pitch gets a double socket inside a lockable box for charging phones etc. As the building works has all been completed year on year improvements to site come from the maturing of all of the planting along with land management to we look to provide the best possible natural habitats for wildlife and nature. We love this place, are putting our heart and souls into making it even more special and look forward to sharing it with you. With over 160 trees and 200 metres of hedging already planted Bloomfield will continue to improve year after year as these grow to screen each pitch and enhance the wildlife habitats on site.